1. Consider the Causes: Cryotherapy has been proven to provide natural joint pain relief in some individuals. However, if there is something that is continually causing regular pain, it’s best to try to identify and eliminate joint pain causes when you can. Repeated movements and some occupational hazards can contribute to joint pain, so can gluten intolerance/celiac disease, and you’ll be fighting a losing battle if depending on cryosauna for relief without doing your best to eliminate or reduce the source of pain. 2. Don’t Make Cost the Most Important Factor: Cryotherapy is surprisingly affordable given the technology used, however it’s obviously more expensive than the best natural supplement from the grocery store. It’s important to remember that you get what you pay for, and in terms of value, cryotherapy may be one of the most cost effective solutions for joint pain relief. Cryotherapy Health And Wellness Inc‘s treatment sessions start with as low as $50 per session, and we offer monthly specials so check back for further discounts and exciting offers! 3. Think About Side Effects: Sure, medications may provide pain relief and can be effective for hip, back and knee pain treatment, but they are also laden with side effects, some more than others. Alternative healing buffs scoff at this, but even popular alternative healing options have side effects too. Aside from unregulated supplements, even natural methods like acupuncture can lead to bruising, muscle twitching and lightheadedness. Whole body cryotherapy is adverse reaction-free in healthy individuals, and that’s a very valuable feature. Check out our list of contraindications. 4. Be Cognizant of Contraindications: Cryosauna is safe for joint pain relief, but not for everyone. People with heart conditions and pacemakers are not able to safely use a cryosauna. And, those with diseases of the lungs, kidneys and bladder are also not good candidates. It’s best to review a full list of cryotherapy contraindications that can make whole body cry treatment unsafe and ensure that the procedure is not dangerous for you and your unique situation. 5. Don’t Under Emphasize the Value of Mind and Body Therapy: From a medical standpoint, the benefits of mind and body healing are possibly undervalued. Some studies have shown that pain resistance can be increased with certain types of mind and body healing. Stress reduction alone can have a significant impact on pain reduction, and together the combination can lead to more enhanced joint pain relief. Click here to find out how cryosauna treatments benefit your mental health, which, in turn, help speed up your natural knee joint healing. 6. Don’t Rule out Anything and Keep an Open Mind: It’s easy to dismiss alternative healing options as hokey or mysterious, but that doesn’t mean that they should be ruled out. For instance, at one point, acupuncture was widely unknown in the west, and today it is so common that it is covered by many medical plans. Whole body cryotherapy is becoming more prolific, and its use in sports physiotherapy is greatly contributing to that. However, it’s still considered relatively new and unknown, although it’s been around for decades. 7. Talk to Your Doctor: Before considering any treatment method for knee joint pain relief, it’s absolutely imperative that you consult with your doctor. He or she will be able to clue you in to potential side effects and safety concerns and alert you to reasons why your specific health situation may mean that you are considering an unsafe treatment. 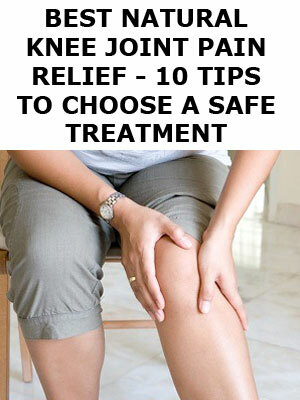 They also are an invaluable source of advice for your specific pain causes and symptoms. 8. Reduce the Triggers: Even the best forms of natural therapy require a little common sense. Cryotherapy can provide pain relief, but it’s best when used with healthy lifestyle changes. Reducing the triggers of pain such as sitting for long periods of time, standing for long periods of time or sleeping uncomfortably, will all make any and all treatment attempts more successful. 9. Commit for the Long Term: Knee joint pain relief is hardly ever an immediate reaction. Most types of treatment require a longer term commitment. That can be frustrating, but the results can be significant. Expect a couple of weeks to see improvement with methods like cryotherapy, with some added pain relief following each session. Remember, quitting before you’re done will always lead to failure. For best results, we at Cryotherapy Health & Wellness Inc. o/a Cryotherapy Toronto recommend a cryo treatment package of 10 sessions (priced at $500) or more. Order yours here! 10. Add Physical Therapy: In terms of providing exercises to increase range of motion and reduce friction, physical therapy also provides valuable education and techniques to keep knee joint pain at bay. Cryotherapy in physiotherapy exists in the form of external ice pack application, but when whole body cryotherapy and physiotherapy are combined, the end result can be much more beneficial.